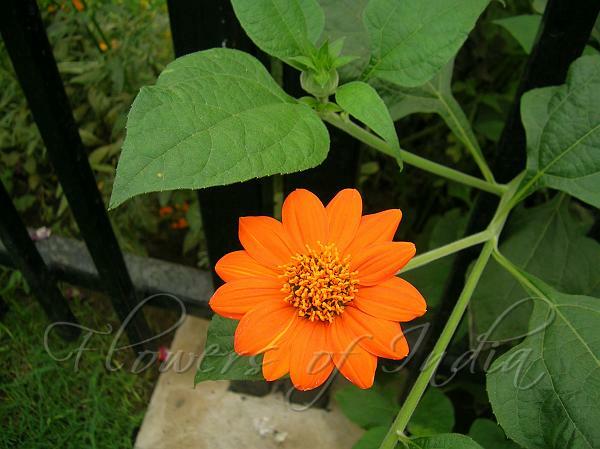 Mexican Sunflower is a superb plant that is relatively little known. 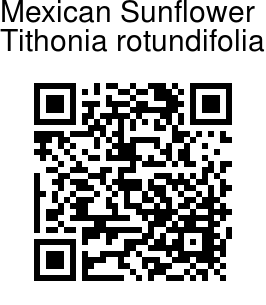 In its native Mexico, it grows up to 6 ft or more, but in the garden it will only reach 2-4 ft. The plants are large, compact, and produce their single, dahlia-like flowers very freely. The flowers are yellow to orange, with a orange-yellow disk, and about 3 inches in diameter. Entire or lobed dark green leaves are alternately arranged, and borne on stalks 2-10 cm long. The leaf blades are 6-33 cm long and 5-22 cm wide, have tapered bases and 3-7 pointed lobes with scalloped or toothed margins. These leaves are finely hairy and greyish-green in colour. When the leaf dries, it is quite brittle.